This will be my only Bay Area Kids Fun review this month. I am going back home to Illinois next week and will not be touching my computer for 6 whole days! So I will see you next month and if you are really missing me and Myles, follow along on Instagram (@julia_crystal17) and SnapChat (@HTBWTB96)! When I decided to start doing this series, I went through tons of apps and websites to put together a list of places that would fall under the category of children's activities. I came up with a wide variety of choices and put them into categories (children's museums, educational museums, indoor play, parks/playgrounds, zoos, etc.) that way I could keep like places together for when I write up my summaries for the Mother's Club newsletter. Last month was two children's museums and so this month I thought I would do an educational museum. one of the "best ice age fossil finds of large mammoths, saber toothed cats, mastodons, wolves, giant sloths, short faced cave bears, camelids, western horses and many other creatures." The museum has since added many other science exhibits and is one of the sites the Math Science Nucleus uses for classroom teaching (ongoing classes, summer camps, field trips, public events, etc.) Also on their website has tons of FREE science-based curriculum. Now as for the museum, admission is $3 each (3 and under free). 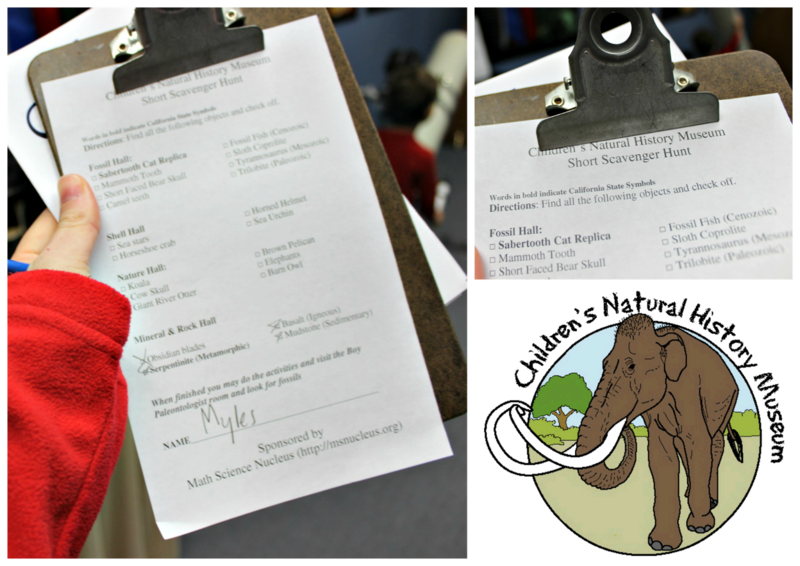 All kids 4-11 receive a scavenger hunt check list and when completed, get to pick out a little prize! The first exhibit in the museum is the Hall of Stars. It houses a Stardome, a few different size telescopes, and a short history of space, Earth, and life dating back 4.6 billion years to the present. 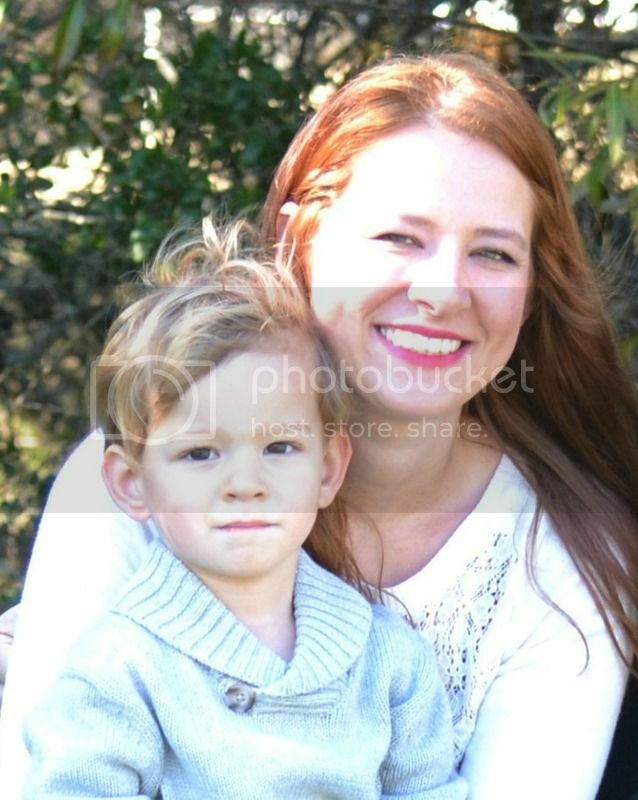 Myles is super into outer space right now, but didn't really interact with much in this area (he is 3 1/2). The next room is the Tools of Early Humans. Here they have some examples of the equipment California Indians used during daily life. 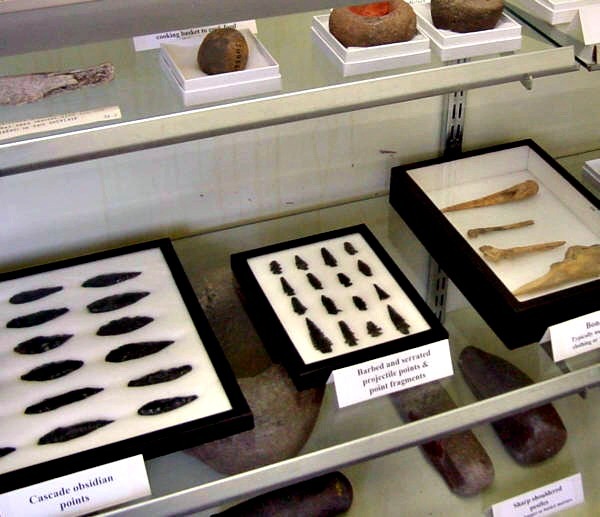 You will find mortars and pestle, spears, arrowheads, and fishing weights all made from local rocks. In this area was also a little history and activity about salt. In every room (or exhibit), you will find a learning activity with an explanation/guide card next to it. Myles (3 1/2) was able to do most of them on his own with me reading the card to him. This one was putting the salt samples in order from biggest to smallest (big chunks versus tiny granules). Nature Hall is all about the animal kingdom. 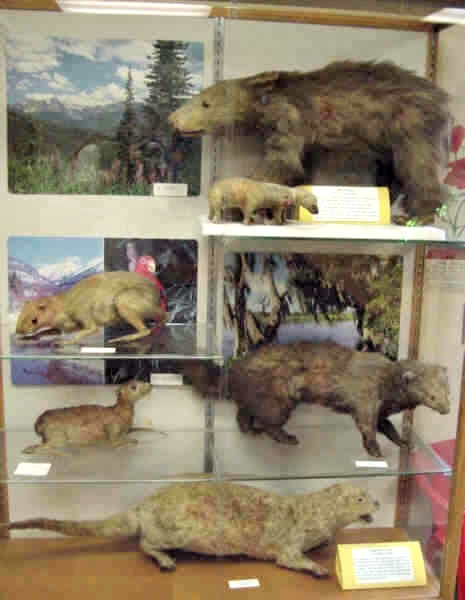 Against all of the walls are shelves housing stuffed (real) animals such as bears, mice, birds, and rabbits. In the middle of the room is a table with several activities. Most of them are matching, which I love; it's a simple activity, but can be catered to a wide age range. The young ones can match on their own (with help reading) and the other ones can focus more on learning the names of the bones, animal classification, etc. This one showed examples from each one of the animal kingdoms and you had to match the animals to the correct names on the cards. The other activities here were bone matching. Myles was able to match the bones to each shape himself and the older kids can learn the names of each bone, what animal they belong to, and their function. 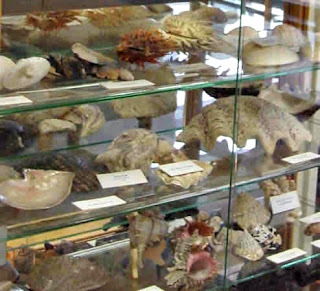 The newest addition to the museum is the Hall of Shells. Besides the fossil exhibit, Myles spent the most time in here. It was one of the smallest rooms, but had a nice display of a variety of shells and marine animals. The reason Myles spent so much time in here was because of this water table filled with shells and sand. 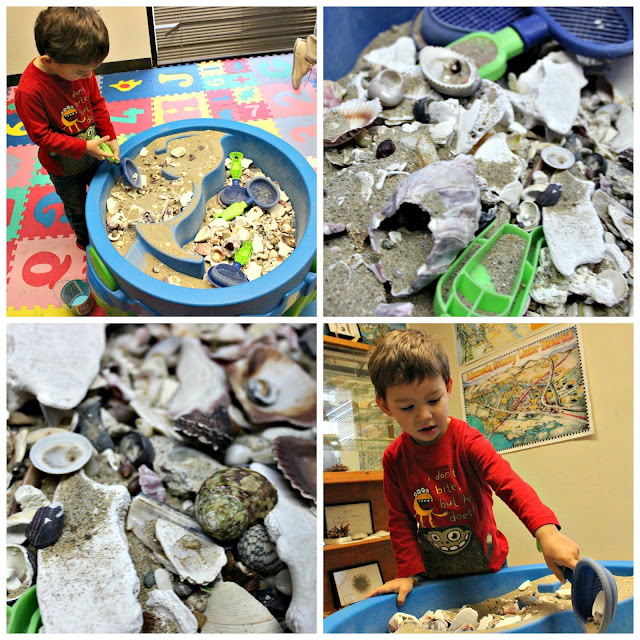 He loves digging, especially for shells, so this kept him occupied for quite some time. Next is the Hall of Small Wonders. The name is pretty self-explanatory; they have some microscopes set-up with different fossils and sands to look at. Myles is too little to really understand what he was looking at, but he did like pretending he knew what was going on (lol). However, I was all over this exhibit; I am always so fascinated by the complexity of tiny microscopic material. The Mineral and Rock Hall is located in the corner of the big fossil hall. Not much Myles was interested in over here, but I can appreciate the beauty of these minerals/rocks. It also has good information on the formation and chemical make-up of the rocks/minerals on display. We left the best for last with the Wesley Gordon Fossil Hall. This is where all of the Irvington Fossils are located. The collection includes mammoths, sabertooth cats, giant cave bears, dire wolves, camels, western horses, sloths, and pronghorn antelopes. The activity in this exhibit was matching modern vertebrate bones (fish, birds, mammals, fish, and amphibians) to their shape and name on the board, then (for the older kids) comparing the modern skulls/bones to that of the prehistoric ones in the fossils. 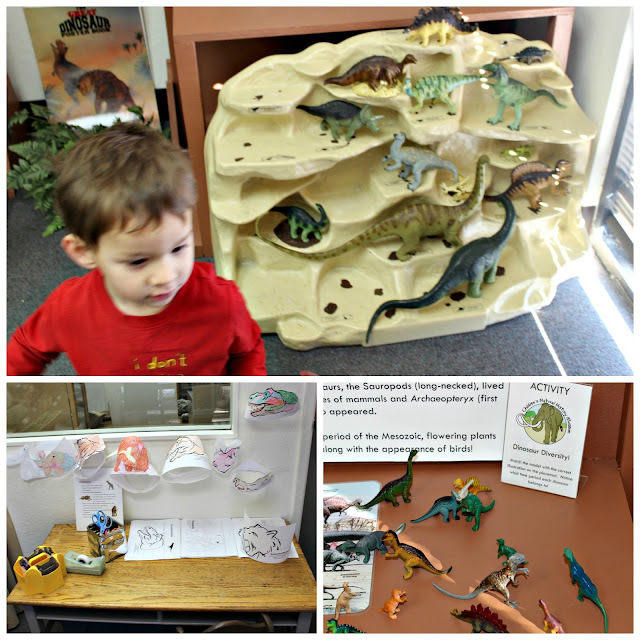 Myles had the most fun in the boy paleontologist room. They have an 'excavation table' set-up to let kids get a feel for how the boy paleontologists worked on finding fossils in the quarry over their ten year dig. 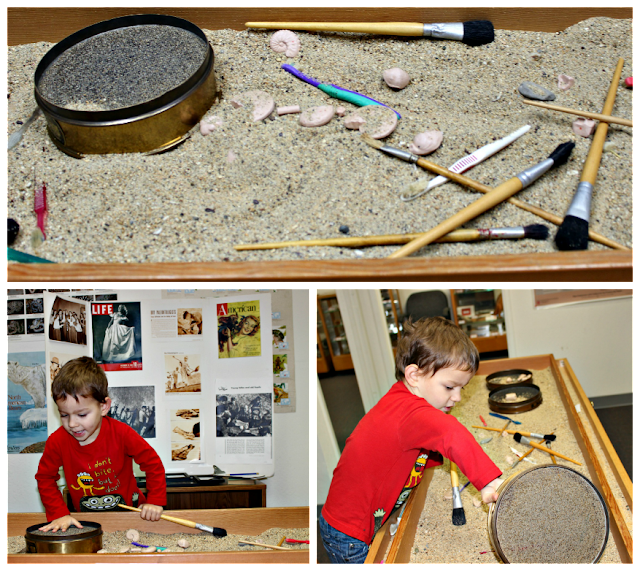 As I mentioned in another review, I love when museums have exhibits showcasing the tools, equipment, materials, etc. that are used in professional careers. Giving kids a chance to work with the 'tools of a trade' is so beneficial, even at a young age like Myles. $3 a person (with 3 and under free). No crowds or rushing (not overwhelming either); only two other families were there. Very educational, but also engaging enough to keep the younger kids occupied. I liked the scavenger hunt as another activity to keep the kids involved if they start to stray off. Very helpful and courteous staff. Not really appropriate for under 3 (may be hard to keep younger siblings entertained). Many items on display are not to be touched (also hard with younger ones). The museum itself is fairly small (but we did spent about 2 hours there). I really had no idea what to expect from this place and even at first glance I wasn't sure it was worth the drive, but after really taking in all that the museum offers, I was so very pleased with our total experience. I could tell Myles had fun, but also learned a lot and the rich local history is so unique and quite unrivaled in the area.